Remember the sea lion pup that snuck into The Marine Room restaurant in La Jolla back in February? Well the once-malnourished pup, since named "Marina," has been nursed back to health and was returned to the wild this morning. After two months of rehabilitation at SeaWorld San Diego’s Animal Rescue Center, the sea lion pup rescued on February 4 at the iconic Marine Room restaurant was be returned to her ocean home on Tuesday, April 5. 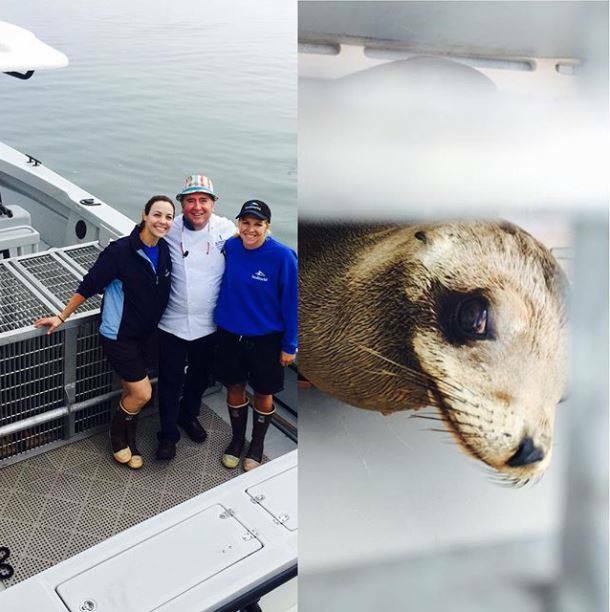 Taking part in the return of Marina was Chef Bernard Guillas, the executive chef of the Marine Room restaurant, who visited the sea lion several times during her rehabilitation at SeaWorld. Rescued weighing only 20 pounds, the extremely malnourished and dehydrated sea lion was considered a “micro pup,” meaning she weighed half the weight she should for her age. She also suffered from an unknown eye injury. Following eight weeks of veterinary and rehabilitative care, Marina has been nursed back to health, her eye healed, gained more than 25 pounds, and demonstrated the ability to forage for food on her own - all keys to being able to successfully survive in the wild. Several other sea lions nursed back to health at SeaWorld San Diego were also returned to the ocean during the outing. SeaWorld San Diego has taken in more than 300 marine mammals already in 2016, with 150-200 rescues recorded in an average year.